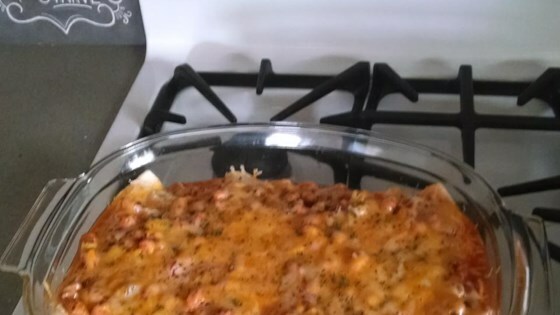 "Nice and spicy use for leftover turkey in a form that even the children will enjoy. Quick, too! Great topped with black olives, green onions, and tomatoes! Leftover ham would also be excellent in this dish." In a medium bowl, mix chile peppers, cream cheese, and cumin. Stir in chopped turkey. Place the tortillas in a microwave oven. Heat for 1 minute, or until the tortillas are softened. Spread about 2 heaping tablespoons of the chile pepper mixture on each tortilla, and roll up. Place the rolled tortillas, seam-side down, in single layer in the prepared baking dish. In a medium bowl, combine the salsa and beans. Spoon the mixture over the enchiladas. Sprinkle the top with cheese. I used leftover pork roast in this recipe and black beans and it was absolutely delicious! My husband & I loved this recipe. The kids however weren't as thrilled. They ate it but I won't make it for the "family" again. My husband and I loved this recipe! It was so easy...is definitely a keeper! Only thing I changed was I didn't have any turkey, so I used chicken breasts insteads. Great recipe, Janice!